Home > Arts & Life > Who’s the Food Dude? 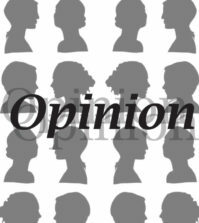 As the end of the semester inches closer, meal plans are running thin and students are stocking up on Ramen noodles and Easy Mac to survive the remaining weeks. College students tend to eat poorly because it’s conveinient, but this is also how the freshman (sophomore, junior, senior) 15 creeps up. 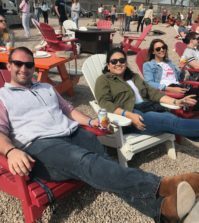 Kevin Roberts, the former host of TLC’s BBQ Pit Masters and a top 10 finalist on The Next Food Network Star, shared his knowledge of nutrition, munchies and recipes with students last Wednesday, Nov. 28 in the Carl Hansen Student Center Piazza. He gave out free food, including bottles of hot sauce, too. Roberts was raised by his mother, a waitress, and two grandparents. He said he finds food inspiration through survival. 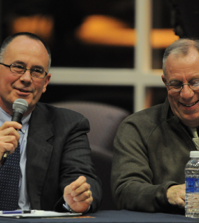 Roberts discussed different alternatives to unhealthy snacks that make stress eating more stressful, including soda, McDonalds french fries and anything including iodized salt. Sugar from soda exits through our pores, which lead to pimples and oily skin. McDonalds fries are made of 60 percent filler, or artificial chemicals. Ramen noodles, a college favorite, has over 780 mg of iodized salt which makes the body bloated and constipated. Alternatives include baked grapefruit with honey and cinnamon, drinking a lot of water and switching from iodized salt to sea salt. Roberts, who studied English at the University of California Los Angeles in order to write his first cookbook, “Munchies”, has taught cooking all over the world, including France and Japan. He’s visited over 165 colleges teaching students how to munch in a healthy way. 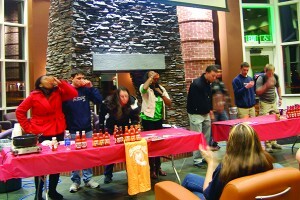 Students compete in a hot sauce contest after Kevin Robert's lecture on alternatives to unhealthy snacks. 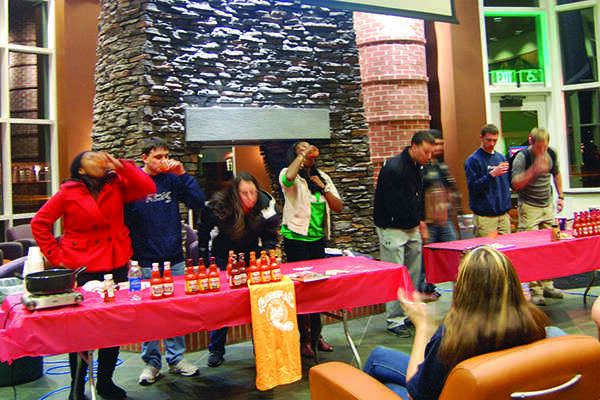 Roberts lecture ended with a hot sauce drinking contest, where students drank cups of hot sauce for a prize package including Robert’s new cookbook, “Kissing in the Kitchen” and a cookie sheet. Tori Batiste, a freshman from Houston, Texas, won third place.